UNDERSTANDING THE WORLD OF FERTILIZER (Part 1): “Do You Know That Fertilizer Does Not Increase Yield” – A Shocker! When you are into crop farming and you haven’t started using fertilizer, you have not really started farming. How true is this? The common norm is; apply fertilizer and your yield would increase”. Yes this may be true at the surface but do you know that the fertilizer isn’t the primary reason while the yield shoots up. The question now is; what is the primary reason why the yield shoots up? Permit me to take you into another secret of successful crop farming. Which is a better option; good seeds (varieties) or fertilizer application? Do not give it much thought, one is as good as the other therefore complement each other’s inherit properties. That said, what is more important is choosing good varieties or seeds cultivar with innate properties among which is, high yield. The truth is that fertilizer would not increase the yield of a variety BEYOND the innate potential of such variety. Then the question is: Why applying fertilizer? Fertilizers are substances which contain essential nutrients for plant growth but if the soil has been extremely fertile in the first place, there might be no need for application of fertilizer of any sort. Except in some rural areas with large span of uncultivated arable land, where else can one find extremely fertile land? • Micro Nutrients sources such as seaweed, azomite, Epsom salt etc. • Urea: This is the most widely used N-Fertilizer. It has 46% of N.
• Compound fertilizer: This is the most common form of synthetic fertilizer commonly known as NPK. It supplies all the 3 major nutrients in different proportion. There are different formulae/compositions available in the market: We have 15:15:15, 20:10:10, and 12:12:12, 10:10:10 etc. • Potassium Nitrate: This is often in form of crystal and easily dissolvable in water. It contains two essential nutrients which are K and N. It is often apply as foliar. It is often represent as 13-0-46. • Diammonium Phosphate: Also known as DAP, It is made from two common constituents in the fertilizer industry and it is popular because of its relatively high nutrient content and its excellent physical properties. It supplies N and also P. It has a formula similar to 18-20-0. • Compound fertilizer: This is the most common form of synthetic fertilizer commonly known as NPK. It supplies all the 3 major nutrients in different proportion. There are different formulae/compositions available in the market: We have 15:15:15, 20:10:10, 12:12:12, 10:10:10 etc. • Single Super Phosphate: Also known as SSP, It also supplies a bit of Calcium (18%) and Sulfur (12%) however it P content (9%) is relatively low to other P-fertilizer sources. • Double Super Phosphate: Also known as DSP. It has a relatively higher P source than SSP. • Potassium Sulfate: This supplies K as well as S where ever both are needed. It is also known as Sulfate of Potash SOP. It has around 44% K and 17% S.
• Langbeinite: This is a unique source of plant nutrition since three essential nutrients are naturally combined into one mineral. It provides a readily available supply of 21% of K, 11% of Mg, and 22% of S to growing plants. • Gypsum: Gypsum is a common mineral obtained from surface and underground deposits. It can be a valuable source of both Calcium (Ca) and Sulfur (S) for plants and may provide benefits for soil properties in specific conditions. • Calcium Carbonate: This is a major constituent of Limestone, is a widely used as soil amendment to neutralize soil acidity and to supply calcium (Ca) for plant nutrition. There are other forms of Lime such as Calcium Magnesium Carbonate (Dolomite), Slake/hydrated lime (Calcium hydroxide), Quick lime (Calcium Oxide). 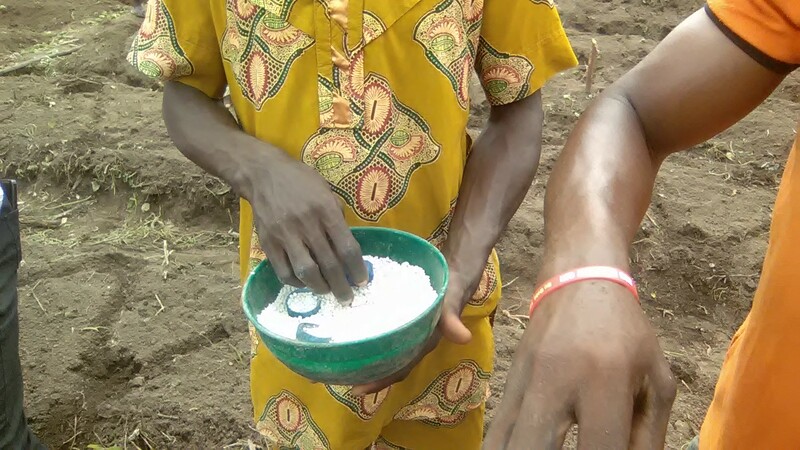 In summary, a farmer would need to determine what exactly is needed by his/her crop and at what stage before deciding on what fertilizer to use. • If you want resistance to diseases/pest, no flower/bud abortion, strong plant vigor/health, apply micro nutrients such as manganese, boron, iron, zinc etc. In addition, while the plants are young, they need more of P-fertilizer immediately after transplanting, more of N-fertilizer at vegetative phase and more of K fertilizer at flowering and fruiting stage. Moreover, P-fertilizer is also needed for large fruits but it is not necessary to apply on P-fertilizer at this stage since the P-fertilizer applies previously would cater for that. The reason being that P-fertilizer has limited mobility in most soil therefore one application may be okay but remember that efforts should be made to place the P-fertilizer as close to developing roots as possible. After deciding the right fertilizer for that is crop/stage specific, you also need to come up with the right quantity per stand if it granular fertilizer, per knapsack and or Liter of water if it is folia or crystal based fertilizer and also per volume of water if it is for fertigation. As for granular fertilizer, you apply between 7 to 10 g per stand per time as basal or side dressing. You can measure that using a leveled cover of bottle water. I hope this article has been of help a little, please visit the site again to read the Part 2 which talks about crop specific nutrients require and also teaches you how to develop fertilizer protocol for your specific crop. HYBRID VEGGIES : UNDERSTANDING THE WORLD OF FERTILIZER (Part 1): “Do You Know That Fertilizer Does Not Increase Yield” – A Shocker!